Screen Media Films has released a new trailer for Jeepers Creepers 3, which will get a one-night-only theatrical release from Fathom Events in theaters nationwide September 26. This trailer is a full minute longer than the first trailer that dropped two weeks ago, giving fans a better look at the iconic Creeper (Jonathan Breck), and those in the small town who band together to put an end to the Creeper's reign of terror once and for all. While we still have a few weeks left until this special event, there has already been plenty of controversy swirling around the movie. Even before production began, we reported last March that the Jeepers Creepers 3 production was being forced to move, just before the production was supposed to begin in Canada. The production shift was forced by The Canadian Performers Union, which stopped a casting call from going out for the film, once the union caught wind of director Victor Salva's criminal past, which has always been a controversial topic in regards to this movie, and the franchise as a whole. The director did finally get production under way last year in Baton Rouge, Louisiana. Victor Salva was convicted in 1988 for engaging in oral copulation with a minor, after he videotaped himself performing sexual acts with 12-year-old Nathan Forrest Winters, the star of his movie Clownhouse. He served 19 months in jail for his crimes, and went on to direct The Nature of the Beast, Powder and Rites of Passage before starting the Jeepers Creepers franchise with the first movie in 2001. He also directed Jeepers Creepers 2, Dark House, Rosewood Lane and Peaceful Warrior before returning to close out the Jeepers Creepers trilogy, although it seems this franchise may still continue. We reported in May that Jeepers Creepers 4 has already been written by Victor Salva, but whether or not he gets a chance to make that movie remains to be seen. 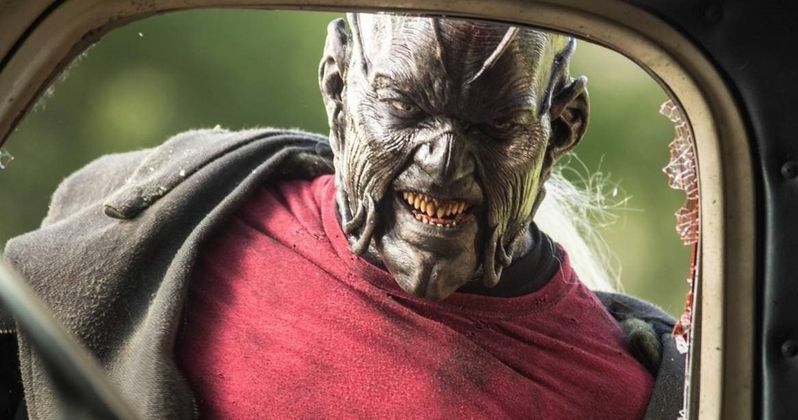 There has been much more controversy about his past criminal behavior than there was on his previous movies, and we reported last week that the cancelled Jeepers Creepers 3 premiere may have even been staged by the movie's own producers, as part of a feud between the producers and Victor Salva. The premiere was said to have been canceled after word spread that there would be massive protests at the screening, but it seems that was all staged by the producers. The sequel brings back Jonathan Breck as The Creeper, along with Gabrielle Haugh, Stan Shaw, Meg Foster, Chester Rushing and Gina Philips. The story is set on the last day of the Creeper's twenty-three-day feeding frenzy, skeptical Sargent Tubbs (Brandon Tubbs) teams up with a task force hell bent on destroying the Creeper for good. The Creeper fights back in gory glory as its enemies grow closer than ever before to learning the secret of its dark origins. Take a look at the new trailer for Jeepers Creepers 3, along with the previously-released poster and photos. Jeepers Creepers 3 Producers Sabotaged Premiere Over Director Feud?